Vintage, public domain Japanese rabbit watercolor. Done in the Japanese style of a large, soft brush with black ink, this rabbit painting by Walter Crane (1845–1915) offers a versatile and charming image to use in your own work. 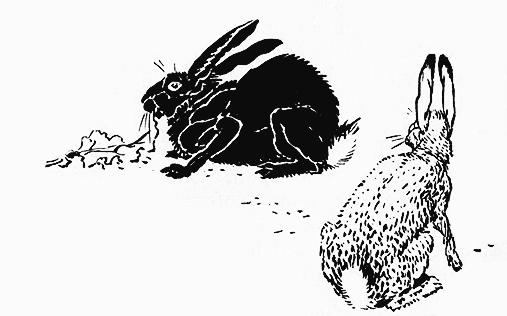 He included this pair of rabbits in his 1900 book on drawing and painting. Line and Form is fill of lessons on drawing and painting. Even better, it has many wonderful pieces like this one. This rabbit watercolor offers a wonderful example of direct brush expression. Crane shares with us a white rabbit drawn using limited color to show the fur but keeping an overall white appearance. The other rabbit is completely filled in, clearly a black rabbit. The black rabbit is eating a bit of what looks like lettuce. The white rabbit looks as if he is contemplating stealing it from him.